Naxos was the first Greek colony to be founded in Sicily around 734 BC. The colonists originated from Euboia (Chalkidians). Naxos was located on the rich and fertile upper west coast of Sicily in the shaddow of Mt Etna. Despite being the first Greek colony, Naxos also lived in the shadow of Syracuse as that great city-state rose to dominate the island. Naxos was also the site where perhaps the first coinage appeared in Sicily around 530 BC. 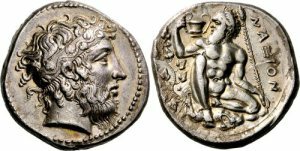 The silver denominations were that of the drachm and litra with the obverse design being that of an Archaic style head of Dionysos and the reverse being a bunch of grapes (Dionysos being the god of wine). This motif illustrated the rich and fertile settlement founded on volcanic soil. Naxos came under the rule of Syracuse around 490 BC. The city issued no coins of her own between 490 and 461 BC. During this period, Naxos remained firmly within the grip of the tyrants of Syracuse Hippokrates, Gelon and Hieron. However, Naxos finally gained her independence in 461 BC and with it came a spectacular issue of beautifully designed coinage in celebration. The basic design remained the same with Dionysios but the reverse now bore the image of the naked Silenos holding a kantharos (pictured here). This coin is considered by many to be the most beautiful designs of the 5th century BC. The coinage of Naxos was redesigned in 430 BC in an attempt to reflect the more modern style of art which was beginning to spread throughout the Greek world. Here, Dionysios appeared with more free-flowing hair and beard and the naked Silenos also appears softer in style. This design continued in use until 413 BC. In 413 BC, Naxos once again redesigned their monetary system following the defeat of Athenian forces who had attempted the conquest its rival city ofSyracuse. This time Dionysios disappeared from the coinage as each denomination took on its own unique obverse design. 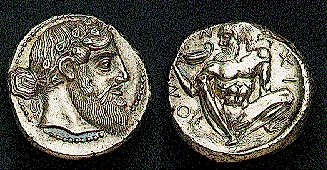 The reverse, however, continue to employ the design of the naked Silenos holding his kantharos, with the single exception of the silver litra. This would be the last coinage to be struck by Naxos before its destiny with fate in 404 BC. The Athenian defeat in Sicily before the walls of Syracuse (413 BC) opened the door in Sicily once again for Carthage to expand her territory. The Carthaginians entered Sicily under the pretense of supporting Segesta in its struggle with Selinus, which was destroyed in 409 BC. 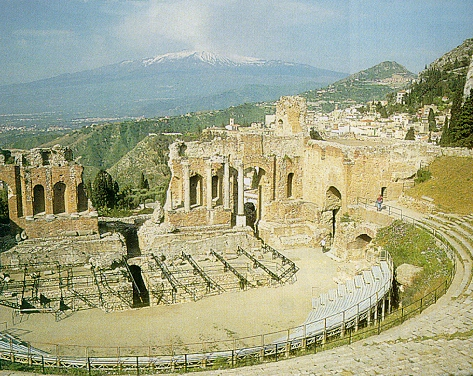 Once in Sicily, the Carthaginians did not leave. In 406 BC, the ancient city of Akragas met her fate – she was sacked and burned by the Carthaginians. Naxos’ fate was quite different. Still bitter about her former suppression by Syracuse, Naxos failed to rally behind Syracuse during the Carthaginian invasion. Under the rule of Dionysios I the Elder, Syracuse attacked and destroyed Naxos in 404 BC. The survivors fled to the mountains where they founded the city of Tauromenion in 396 BC following the defeat of Carthage.